LOCAL ELKS' LODGES HOLD THIS ANNUAL CONTEST IN A LOCAL GYMNASIUM & MANY TIE THE CONTEST INTO THE LOCAL SCHOOL GYM CLASSES. ALL LOCAL LODGE WINNERS IN THE VARIOUS AGE GROUPS ARE AWARDED TROPHIES & PRIZES AND SENT TO THE DISTRICT CONTEST. WINNERS OF THE DISTRICT CONTEST ARE THEN SENT TO THE STATE CONTEST. STATE WINNERS ARE SENT TO THE REGIONAL CONTEST. YES, THE REGIONAL WINNERS ARE AWARDED MORE TROPHIES & PRIZES AND SENT TO CHICAGO FOR THE NATIONAL FINALS. ~ The Elks Hoop Shoot is a national free throw contest that provides youth ages 8 to 13 an opportunity to compete, connect and succeed through hard work and healthy competition. 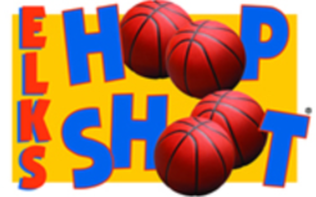 Six winners from each of the 12 Regions will compete at the Hoop Shoot National Finals held on April 27, 2019, in Chicago, IL, home of the Elks headquarters. The Hoop Shoot National Finals begin at 8:30 a.m. Central Time on April 27. If you can’t get to the gym on Saturday, you can follow the action from home. Get live updates from the foul line by using the Elks’ online shot tracker and following on Twitter using #HoopShoot. * Elks Hoop Shoot is fully-funded by the Elks National Foundation, the charitable arm of the Benevolent & Protective Order of Elks of the USA.